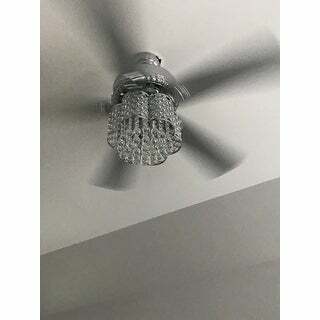 the fan is very beautiful and the picture don't do nothing for it, it is one of those fans that you would like to buy and put up in every room. Every home owner needs to take advantage of the benefits of indoor ceiling fans. They provide the most cost efficent option in cooling your home. Perfect when the weather is too hot and humid and you don't want to turn on your airconditioning. The Deidor is a remote controlled 52-inch chandelier ceiling fan that perfectly suits this need. The blades rotate with the help of our very dependable three (3) speed reversible motor used in all our high quality ceiling fans. A stylish chrome finish is matched with silver painted blades. The included chandelier is a beautiful mixed shapes crystals and a flower designed chrome grid shade. 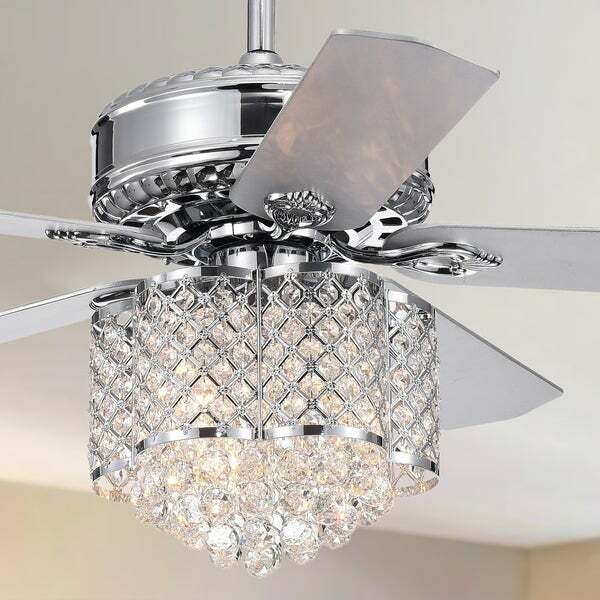 A luxurious alternative to the standard can-type lighted fans. Add elegance to your life. Dimensions 52.0 In. X 52.0 In. X 22.0 In. 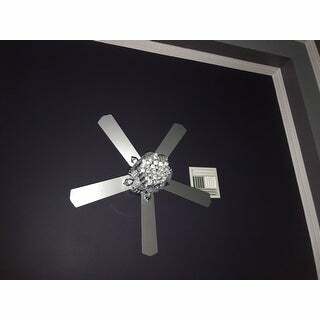 Gorgeous fan, nice decorative fixture, but I am very disappointed with it after the installation. The motor runs very loudly: you can hear it from the room above. Luckily, we installed it in the living room, it would be a disaster in the bedroom. I can hear the motor running from in my bedroom that is one level above without laying on the floor, even from my bathroom, - and we have a large master bedroom suite. Low speed is extremely fast, I do not see us using other 2 speeds. Also, the vibration of the fan increases significantly on a medium and fast speeds, to the extent that it feels unsafe. Crystals are literally starting bouncing around on a medium speed. The lower part of the fan doesn't appear to stay balanced and is sort of sideways no matter what we tried to do to it to align properly. Per contractor, the installation instructions appeared to be semi-confusing. After seeing so amazing reviews for this fan, I am a little bit confused. This fan looks absolutely stunning in my bedroom and did I mentioned that I had the table lamps to match. I am absolutely in love with it. The remote is just perfect and allows room to stay comfortably in bed on a lazy night. A dimmable switch is recommended. Wow! This ceiling fan is exactly what I’ve been looking for. The quality is excellent and the install was easy. It’s chic, elegant and classy. 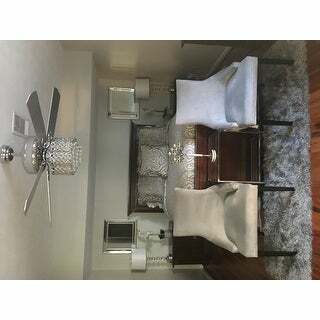 The smoothe chrome finish and chandelier design is sure to upgrade any room in the house. I’m so happy that I purchased it. This looks beautiful and elegant in my bedroom. Everyone who visits my home loves this light fixture. The crystals were a bit difficult to hook onto the light. I love the remote control feature! This fan is absolutely gorgeous, show stopper! The cold of the blades is perfect, the bling is just what every girl wants in her bedroom. I would ut this fan in any room in the house! 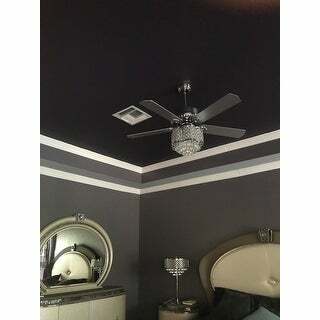 Gorgeous ceiling fan! My only problem is it doesn’t have pull chains it’s a remote operated only. Was pretty easy to install, I did have issue placing the transmitter (remote)in the ceiling box with all the wires. We got it up and going looks fab, the crystals balls do rattle a tad bit. I absolutely love the design of this ceiling fan. I bought it for daughters room which matches perfectly with her decor. 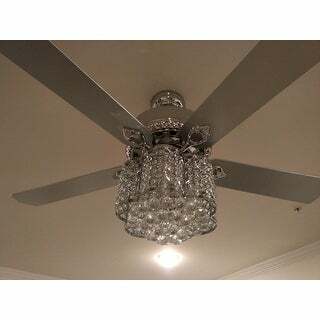 I've had a lot of compliments and everybody ask me where I got the chandelier ceiling fan from. Everything came included and was assembled within probably an hour and a half. Actually the longest time was putting the little chandeliers on individually which was a pain but when you see the finished product was worth it. I've had the fan for 6 months now no complaints great purchase. Beautiful, takes some time to add the crystals. The remote add ease of use. Beautiful fixture with a quiet motor fan. I discount one star because the crystals are very difficult to attach, and some of the attaching hooks were dropped too low to keep the crystals hanging at the correct level. Took some work to get everything lined up. But, in the end, a beautiful light/fan combo. I have never seen a more beautiful fan. 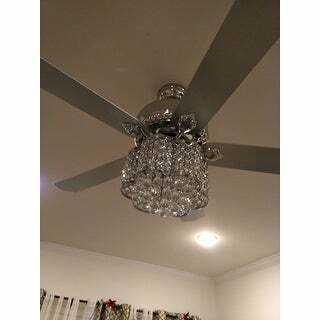 I really wanted a chandelier and was bummed that I would have to trade it for a fan, this is the best of both worlds. Super blingy and classy. It's quiet and gives off a lot of air. I originally had regular bulbs which throw off a yellow hue, I changed them to bright white bulbs and it looks even more amazing. I had a professional installer do the install, it was a little time consuming for him attaching the crystals, but other than that it went quick. This is more a chunky fan than delicate. You will not be disappointed, this fan is really gorgeous. This fan is beautiful, we love it! Nice, quiet motor, and excellent air circulation. It does wobble a bit, when on high, but not bad. I purchased two of these to go in the upstairs bedrooms. The pictures do not do them justice. Thanks to Overstock, I was able to find a matching flushmount light to go in the foyer outside of the two bedrooms. Stunning! Beautiful fan at a great price. 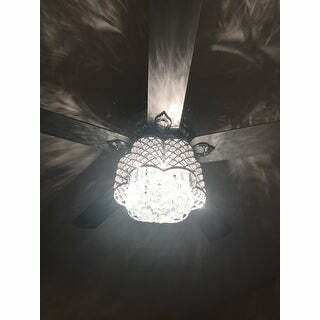 This fan/chandelier is absolutely stunning! If you’re looking to make a statement in your room you want this! Not to mention it looks much more expensive than what it costs. 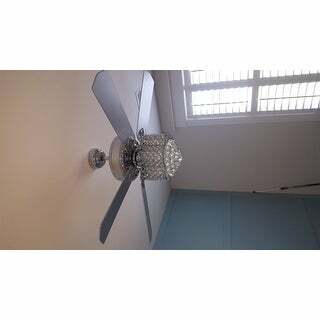 Very classy and stylish ceiling fan. The crystals were tough to connect, but it was well worth the time spent hanging each one of them. It looks absolutely gorgeous! Second ceiling fan purchased and all I can say is did I hit the jack pot. Another excellent pick to complaint my new house. Thank you if you are looking for bling. This fan is more beautiful in person than it is in the picture. I purchased the fan several months ago and just had it installed. It works perfectly. I installed the crystals and it was not as bad as I thought it would be. The lighting is adequate and crystals don’t jingle when fan is on. This chrome ceiling fan was purchased in error. It is beautiful and if I had a spot in my home for it I would have kept it. It looks very classy and would be beautiful in any room. "I have tried calling Overstock, the number for the manufacturer and have been unsuccessful in finding out if this fan has an available longer downrod. Can anyone tell me yes or no and where to find it?" "Can someone please tell me if this canbe mounted flush to the ceiling? I absolutely love it but only have 8’ ceilings." I asked my electrician and he said no it cannot be flush mounted. "Can this fan be mounted flush?" "Can this fan be wired to a wall switch or remote only?" No, this is designed to work with the remote only. "Since I only have 8' ceilings the overall height of 22.2" is concerning. Can the fan go flush against the ceiling without the 5 inch rod? What is the shortest height?" "Can this fan be hung flush mount? I only have an 8ft ceiling in the room I’m installing this in." "I’m planning to place this in my bedroom. Can anyone tell me if the crystals hit each other and make noise when the fan is on? Thank you. " A ceiling fan can make a room more inviting and comfortable. But does your ceiling fan wobble and clink? In the middle of the night, when you're blindly fumbling for the pull chain above your bed, do you long for the silent, energy-efficient model you know you deserve? From size to style, here's how to choose the right ceiling fan to revive clean air in your home.